I’m wearing tennis shoes with my pajama dress right now. It has to do with me trying to kill a bug and instead having it fall somewhere shadowy and full of hiding spots and now I feel like it’s everywhere. I’ve failed at bug killing twice in the last week! It’s summer, don’t these bugs want to be outside? And once, Elliot licked a bug when I was hoping he’d take care of it for me. So it’s not even 8am and there’s been bug drama. So in less bug news and more good news: scones! When I made these I ended up with 9 amazing scones and 3 scones that were burnt on the bottom. Blackened scones happen sometimes. But it’s ok, they’re just cajun-style, right? So basically, you should make these. 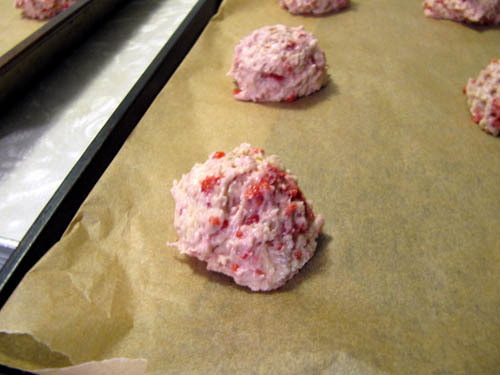 They are lightly sweet and the chunks of white chocolate are best friends with the raspberries. It works out for everyone. Pass them out to anybody who needs a blush breakfast. *Fresh or frozen will work. Frozen might be a little less messy, but why use frozen when you have freshly picked ones? 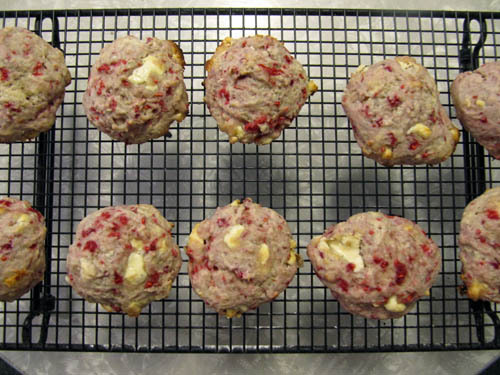 Scoop using a muffin scoop or using a 1/4 cup measuring cup dusted with flour onto a parchment lined baking sheet. Bake for 10 minutes, or until golden and the top center is set. Cool on a wire rack. I ate two immediately out of the oven. Waiting for scones to cool is overrated. Amazing. Simply amazing. Thank you so much for this one, little lady! 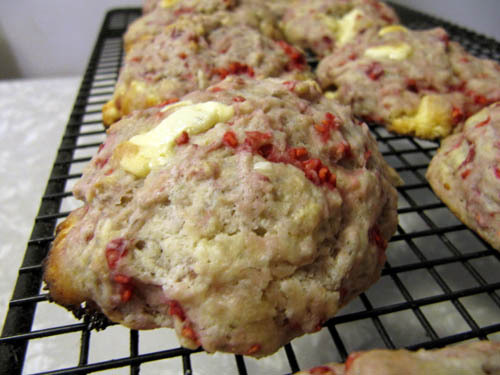 I’m always looking for a perfect scone, and I think this is it. Best of all, they’re pink. They made me super a.d.d. while they were baking, too. The warm raspberry smell had me opening the oven every ten seconds because staring through the oven window wasn’t good enough. I needed my face all up in them! Thank you, Megan! Yes! I’m so glad you liked these Kristy. I too was pretty enamored with the pink color. Raspberries are so thoughtful! Ah! It was stolen! Thanks for telling me. So, this is the second time I have made these since I saw this post. They only lasted 3 days in our house. There are two of us. 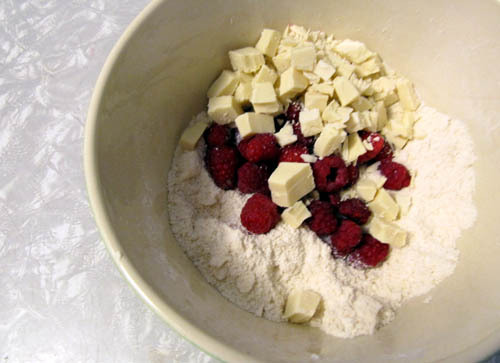 I have some raspberry white chocolate scones in the oven right now 🙂 PS where have you found white chocolate chunks? I am using white chocolate chips instead. Thanks for the recipe!